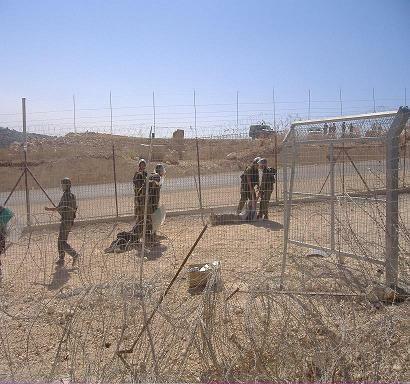 At today’s weekly demo against the Apartheid Wall in Bil’in soldiers attacked protesters with batons and fired rubber bullets at them from close range. 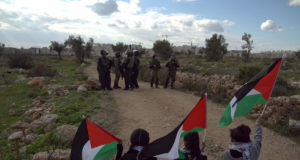 Around 100 protesters including international and Israeli peace activists marching from the village mosque to the site of the Wall were confronted by lines of soldiers in riot gear at the edge of the village. Without provocation or intimidation the soldiers waded into the demonstration lashing out indiscriminately at the marchers. An American peace activist, Magan, suffered a concussion and severe bruising after being beaten on the forehead whilst Anna an American activist suffered severe hand injuries. Demonstrators attempted to sit down but the soldiers’ repeated beating led them to disperse. An Italian and an Israeli activist were beaten so badly they had to be stretchered off to the ambulance to receive medical attention. Although injured both are now able to walk again. Palestinian non-violent activists Mansour and Saif also suffered particularly heavy beatings who later in the day arrived at the hospital for treatment. A Spanish activist and two Palestinians were arrested but released at the end of the demo suffering minor injuries. As protesters dispersed the soldiers continued to pursue them back to the village. When Saif called for activists to avoid the soldiers’ beatings he was shot at and hit twice with rubber bullets. Not content with this level of brutality soldiers shot several more protesters with rubber bullets as they walked back to the village. Shooting Saif one more time in the back, and shooting at a group of other ISM activists. Anna in addition to her hand injury suffered one rubber bullet in the back and one in the hip. The soldiers then detained two activists but they were de-arrested by fellow activists. The severe beatings indiscriminately given out at today’s demo continue to portray the Occupation forces’ escalation in violence against peaceful protest. 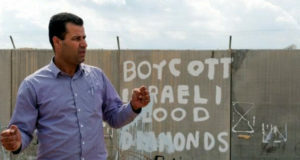 The villagers of Bil’in will not be intimidated by such brutality and vow to return next week to continue their struggle against the Occupation and theft of their land. Andrianes an Italian activist beaten badly with a baton. Mansour Mansour the Palestinian ISM Campaign Coordinator was severely beaten with a baton. Saif Abu Keshek the Palestinian Coordinator living in Spain was beaten with a baton and shot with 3 rubber bullets in the back and one in the leg. 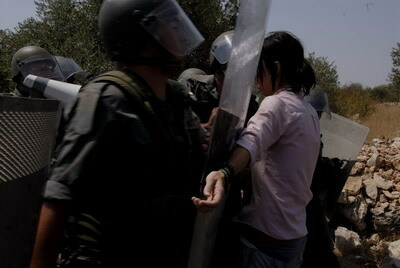 Anna from US suffered injuries on her hand as well as 2 rubber bullets, one in the back and hip. Lina from Germany suffered a rubber bullet wound on her leg. 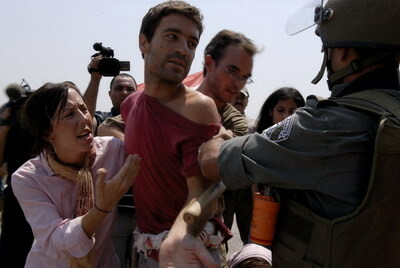 Jonathon Pollack from Israel suffered severe beatings with a baton. Dave from Ireland suffered beatings and a rubber bullet wound to the back. Magan from US suffered harsh beatings with the baton, including one to her head, resulting in a concussion. Coby from Israel suffered beatings from a baton. 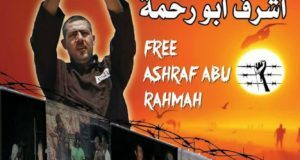 Adeeb a Palestinian suffered beatings and was detained and later released. Mohammad Khatib local Popular Committee member was detained and later released. David from Catalonia was detained and later released.